Welcome back as we wrap up this week’s Top 40. If you missed the previous songs, you can go back and check out songs 40-31, 30-21, and 20-11. This has been a great week of music so far. And there are some classics here today. And don’t forget, you can click on the song title to get to the YouTube video to listen to the song. Now, let’s Return to the week ending October 17, 1981, and wrap up this week’s countdown. We begin the top 10 with a decent rock song. This is off of The Little River Band’s Time Exposure album. The album was produced by George Martin. This was the band’s last album with Glen Shorrock on lead vocals until 1988, and with lead guitarist David Briggs. This was Dan Fogelberg’s third Top 10 hit on the Billboard Hot 100. This song is notable for featuring the late (I still can’t believe I’m saying that) Glenn Frey. This was the first single from Stevie Nicks’ debut solo album, Bella Donna. It was written by Tom Petty and Mike Campbell, inteneded to be a Tom Petty and the Heartbreakers song. However, Jimmy Iovine, who was also working for Stevie Nicks at the time, arranged for her to sing on it. This was a good call, because these two unique voices sound great together. How could a song with a handclap in the chorus be bad? This classic Hall & Oates tune was a staple on MTV. It would go on to be a #1 hit, holding that top position for 2 weeks. This country-crossover hit was also the #1 song on the country chart this week, and would peak right here at #5 on the Billboard 100. This was the theme song of the 12th James Bond movie of the same name. Easton is the only artist (to date) to be seen singing the theme song to a Bond movie during its opening titles. This song was also nominated for Best Original Song at the Academy Awards in 1982. This song was my introduction to The Rolling Stones. I didn’t have MTV yet, but I did see the song on the television show, Solid Gold. The basic track of this song was written during the 1978 sessions for the Rolling Stones’ album Some Girls. It was at first cut as a reggae-rock track named ‘Never Stop’, but after dozens of takes the band stopped recording it and it was shelved. In 1981, with the band looking to tour, engineer Chris Kimsey proposed to Mick Jagger that archived songs could be put in the set. It was re-worked to the classic that we now know, and was recorded for the Tattoo You album. This is Lionel Richie’s third entry on this countdown. This was recorded as the title track of the film adaptation of Scott Spencer’s novel Endless Love. The song ended up being a bigger hit than the movie, reaching number 1 on the Hot 100, where it stayed for nine weeks from August 15 to October 10, 1981. Before we reveal the #1 song, let’s see what was topping some of the other charts this week. The #1 R&B song this week was “When She Was My Girl” by The Four Tops. Topping the Dance charts was “Do You Love Me” by Patti Austin. And we have another movie soundtrack song. 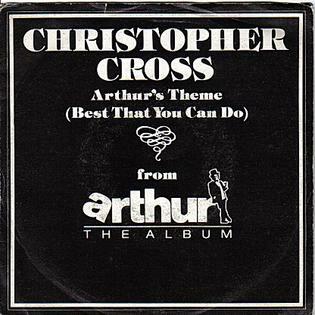 Coming off his mega-successful self-titled debut album, Christopher Cross followed up with this smash hit. This would be a #1 hit for 3 weeks. The song also won the Oscar for Best Original Song. Although his music was still great, Christopher Cross’ popularity faded away quickly once everybody started getting their MTV. This was definitely his high point. Well that wraps up this week’s countdown. I hope you enjoyed it as much as I have. Let me know your thoughts on this list, and on any part of the countdown. We’ll count down a different year in the near future. In the meantime, Keep your feet on the ground, and keep reaching for the stars. I liked the middle two days of the countdown better, but each day this week had some very good songs. I think I’m going to have Dan Fogelberg and Eddie Rabbitt in my head the rest of the day. Can’t complain about that!